Your daughter is sure to make a splash when she steps out in one of our beautiful girls bathing suits. Choose from either one-piece or two-piece styles in a variety of designs to perfectly complement your daughter's personality. 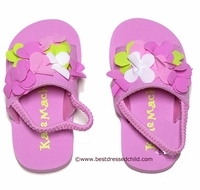 Our fun summer styles are perfect for wearing to the beach or the pool. Our infant bathing suits are made by brand-name designers that have a reputation for producing high-quality children's clothing. 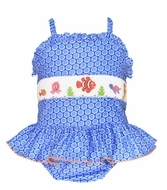 Their infant swimsuits are designed with bright, vivid colors that any child will love and many styles include feminine embellishments such as ruffles and bows. 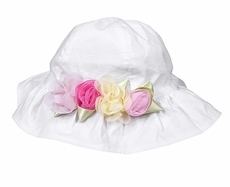 In addition to our baby girl swimwear, we also offer a large selection of accessories including hats, sandals, cover ups and more. Our swim accessories make it possible to outfit your daughter for any activity, whether she's attending a pool party at a friend's house or enjoying a relaxing day at the beach. 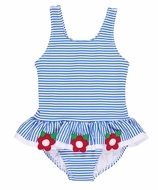 Help your daughter have more fun this summer by choosing one of our fantastic infant girls' swimsuits. Our impressive selection of styles and designs will keep your little girl looking great while she battles waves and beats the heat this summer.